Q I am a 56-year-old woman. I began experiencing numbness in both hands after taking care of my grandson who is 10 months old. It started with numbness and a feeling of pins and needles in the palm. Now, there is also a "frozen" feeling. The symptoms usually occur early in the morning. I have seen a doctor at the polyclinic. My full blood test results were fine, while a neck X-ray scan showed wear and tear. The doctor suggested that I consult a neurologist. As the wait to see the neurologist is nine months, I decided to try acupuncture. It did not help. What is wrong with me and what can I do to improve my condition? A Numbness in the hand is usually caused by damage, irritation or compression of a nerve in your arm and wrist. You may have carpal tunnel syndrome, which is a common cause of palm numbness. In this condition, the median nerve is compressed, leading to pain, numbness and tingling sensations. Numbness of the palm is also often seen in cervical spondylosis - age-related wear and tear that affects the joints and discs in the neck. Other diseases associated with this symptom include Raynaud's disease, which causes the body to feel numb in response to cold temperatures or stress; and ganglion cysts, which are non-cancerous fluid-filled lumps along tendons or joints of the wrists and hands. In traditional Chinese medicine (TCM), palm numbness is likely linked to problems with the liver, kidneys and spleen. You may also lack qi (vital energy) and blood, or have a stagnation of these elements in the body. External injuries and pathogenic factors such as wind, cold and dampness could also be involved. According to TCM theory, the liver governs the tendons and the kidneys produce marrow and control the bones. When there is a lack of liver blood to nourish the tendons, one may experience symptoms such as numbness and tremors of the hands or feet, or even difficulty in flexing and extending the limbs. Our bones, on the other hand, require nourishment by means of kidney "essence". When the kidneys are weak - due to ageing and chronic diseases, for example - it will lead to an aching and weak skeletal system. A person who lacks both liver and kidney yin may suffer from numbness of the palm, fingers, shoulder, neck and joints, together with shrivelling muscles in the hand. Your condition may also be traced to the spleen as it governs the muscles around the joints and converts nutrients into qi and blood. A diet containing cold, spicy and oily food may weaken the spleen, as will fatigue and a weak constitution. This causes nutrients to be converted into phlegm and dampness. The spleen will also be unable to produce enough qi and blood to nourish the spine which, in turn, leads to chronic pain and numbness of the palm, fingers and joints. A general lack of qi and blood also paves the way for external pathogens to easily invade the hands. In particular, wind, cold and dampness will cause numbness in the palm and fingers, as well as limit the movement of one's joints. An external injury may be another reason for your problem. For instance, doing repetitive motions may strain the hand and wrist. This can weaken the qi and blood circulation in the body, causing both elements to stagnate in the meridians, which are channels through which qi travels. This stagnation can give rise to severe prickling localised pain and numbness of the palm, fingers, neck, shoulder and limbs. You may consider a combination of Chinese medicine, acupuncture, cupping therapy, tuina and moxibustion to improve your condition. Cupping therapy involves placing heated cups on the skin to enhance blood and qi circulation. Moxibustion involves burning a small herb above acupuncture points to help healing, while tuina is a TCM massage treatment. First, boosting your liver and kidneys will strengthen the muscles of the palm. Herbs that can help with this include processed rehmannia root and desert-living cistanche. 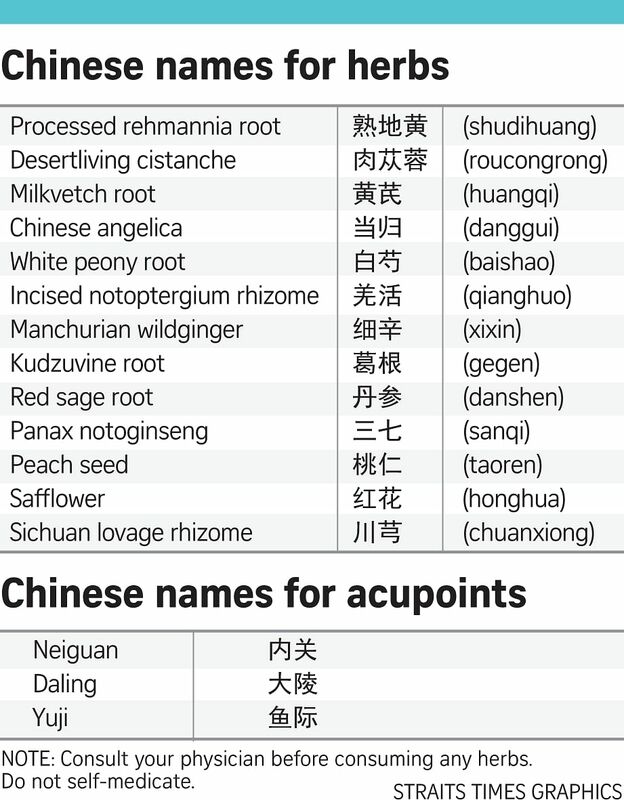 To increase your qi and blood, try milkvetch root, Chinese angelica and white peony root. To dispel wind, cold and dampness, consume incised notoptergium rhizome, Manchurian wild ginger and kudzuvine root. Enhancing your blood circulation can be done with the help of red sage root, panax notoginseng and peach seed. Besides consuming herbs, you can also wear a wrist splint. This may help to reduce numbness by limiting the flexing of the wrist. Avoid any activity that causes pain, swelling or numbness in your hand, particularly those that require force or involve repetitive movements, such as carrying a baby. Keep your palms warm - do not wash your hands with cold water or expose them directly to air conditioning. A simple herbal soak may ease your symptoms too. Prepare a basin of water at 40 deg C and add herbs such as safflower, Chinese angelica and Sichuan lovage rhizome to it. Soak your hands in the mixture for half an hour daily. This can improve blood circulation which will, in turn, reduce the degree of numbness. It may help to massage on the neiguan, daling and yuji acupoints too. Specify Sinseh Says as the subject and include your name, age, gender, identity card number and contact details.